Through the generous support of the Megee family the Jason Anderson foundation is able to work with youth sports organizations in Sussex County. …at Atlantic Midway Theaters in Rehoboth Beach. This slide will appear on all standard screens at the theaters starting after the Labor Day holiday. The Jason Anderson Foundation is now receiving applications for Spring 2018 grants. The Seahawks are in the Henlopen Pop Warner football league and offer football and cheerleading programs for boys and girls ages 5 to 15. 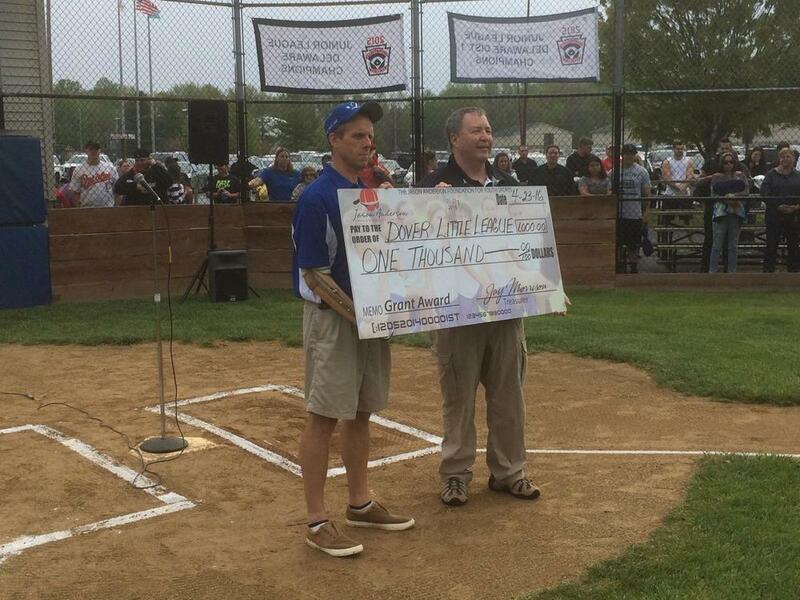 Photo Above: Marc Anderson presents Dover Little League with $3,000 grant award before a game. Photo Below: Ryan Anderson stands next to Jason Anderson Foundation banner placed by Dover Little League on home field. The Jason Anderson Foundation for Youth Sports awarded the very first grant in the New Orleans community this past week to Project Peaceful Warriors. ...thanks to the Delaware Sports Commission and the Slam Dunk to the Beach Committee for, once again, selecting our Foundation as its charitable organization of choice for the 2016 Slam Dunk to the Beach tournament. A $1,000 grant check was presented in November to Delaware's Western YMCA to help kids who need a boost to play a youth sport. On September 24th, 2016 The Jason Anderson Foundation President Marc Anderson and Board Chair Andrew Schwab, along with help from Ryan Anderson, present a $1,000 grant award to Coach Ron Moore and the Kent County Stallions in support of their youth football program. Foundation President Marc Anderson presents a check for $1,000 to the Dover Little League on Saturday, April 23, 2016. This represents the Foundation's first of three initial gifts to help kids in need participate in a youth sport of their choice.